Every building we visited in Istanbul was huge; every builder in history seemed to have a point to make. His work would stretch higher into the sky, would occupy more space on the prime location, and would dominate the skyline, and everything would be built to last. The underground cistern beside Hagia Sofia was built in the 6th century in the Byzantine era by Justinian as part of the water storages for the city. The history says that, for the construction, they reused masonry and stones from older Roman structures. This means that many of the pillars supporting the roof are capped with elaborately carved capitals, there are decorated columns amongst the plain ones, and then there are the Medusa heads. Various stories have been told about these heads; that they are facing away from the main body of the cistern to ward off unwanted spirits, that they are upside down so as to minimise their power to turn a man to stone, or, my favourite, that the blocks were the right size to fit a gap at the bottom of a pillar and they were turned to the optimum position to fit. The space is huge, as large as any cathedral above ground; the lighting adds to the feeling of great volume, both illuminating some parts and letting others, the further reaches, fade into shadow and darkness. The water is shallow and occupied by a colony of fish; the bigger ones with an eye on the main chance are near the entrance, while the further you move into the cistern, the smaller the fish are….. According to the literature, the cistern continued to supply water to the nearby Topkapi Palace into relatively modern times, an extraordinarily long useful life. It seems now though, that nothing is built to last for a long time; there’s the excuse of technological change creating different imperatives, but sometimes it seems that not enough effort is put into revamping existing structures; the answer always seems to be to knock it down and start again. It’s a very strange feeling to see buildings that I remember being built now being abandoned and demolished. Most of it might be to do with the hideousness of much of what was built in that period, but surely not all of it? Shopping is not something that I would ever regard as a leisure activity, but on trips to new places it is always fascinating to see what is on offer, for the insights it affords to the life of the country I’m visiting. It’s therefore usually more interesting to look at the stock in a supermarket or a local food shop, than to check out all the souvenir stalls in the world. But sometimes it just feels like a duty to try to play the dedicated tourist and look at the cornucopia of brightly coloured knick-knackery and assorted stuff, the cheap reproductions of the country’s cultural and historic highlights that are laid out to tempt us into making a direct and generous contribution to the local economy. The Grand Bazaar in Istanbul is on every self respecting tourist guidebook’s list of the ‘must see’, and, as it was within walking distance of our hotel, there was no real excuse not comply and go and look. And there-in lies the rub. It’s impossible just to look in the Bazaar. As soon as your pace slows when a particularly bright geegaw catches your eye, up jumps the stall holder to ‘just ask you a question’, or point out each of the twenty five colours in which the bibelot can be bought, as if you couldn’t already see each and every one for yourself. It’s a cultural difference, I acknowledge that. I’m a standoffish Brit, who wants to look at the merchandise quietly, know how much it will cost, and only engage in the the briefest of conversations. The surest way to guarantee that I won’t buy anything is for the stall holder to bombard me with a deluge of words, a litany of goods on display, to demand that I come into his shop, or to fire questions at me. You’ll understand then that my purchases were very modest, and only from a man who stood beside me in silence while I looked. And his silence paid off, because after the first round of negotiation on price, I gave in, because haggling over money doesn’t appear anywhere on my list of pleasant things to do. The Grand Bazaar was, however, well worth the visit, as the guidebooks might say, for its sheer size and the abundance of merchandise on display; for the arches and domes in its construction and for the brilliance of the blue tiling, and the bright colours and intricate arrangements in many of the stalls. It’s very satisfying when you see what you expect to see, without being disappointed, isn’t it? I realised as I arrived in Istanbul that there were many things about the city, and about Turkey and its history of which I was embarrassingly ignorant, and it was reading the guidebook and simply looking at what was around me that revealed the extent of my failings. One of the things, however, that I knew I wanted to see was the golden mosaics in the Byzantine churches. We only made it to Hagia Sofia, but I was not disappointed, and that is remarkable given that half of the nave was filled with a complex of densely constructed scaffolding. Much of what is impressive about the deconsecrated church is its sheer size, the height of its domes, and the smooth patina made by thousands of feet over the centuries on the flagstones on the floor, but it is in the upstairs galleries where the fragments of the mosaics remain. Apparently the plaster laid over them in the 19th century have both saved them from destruction, but also make them difficult to preserve and see today. But what you can see is exquisite, with such detail in the colour of the shading of the eyes and the cheeks, and the decorations in the clothing on the figures. It amused me no end that when I took a couple of photos with my phone it put one of those little squares around the faces of Mary and the baby Jesus inviting me to ‘tag’ them with the name of one of my friends or contacts. It’s a technological step too far for me……. Here we are with a series of ‘firsts’. 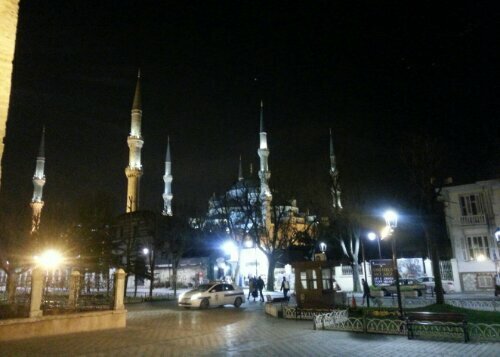 It’s the first time I’ve been to Istanbul; in fact it’s the first time I’ve been anywhere in Turkey. I’m also still in the early learning phase of how to use my shiny new sweepy swipey mobile phone, and working out how to hold it properly still and straight-ish to take a photo. And given that WordPress has declared this a month dedicated to posting photos taken with one’s phone, and I’ve been ignoring the daily exhortations until now, maybe today is the right day for my first attempt, courtesy of the hotel wifi (another first, sort of). It’s a tad stressful as the process has crashed a couple of times now, and I’ve lost beautifully crafted prose (!) So I’m going to cut my losses now, and see what happens…..